THE great Indian Subcontinent enclosed, in the north – stretching to the northeast by the grand Himalayas and in the south delimited by the Indian Ocean. It’s been home to various civilizations in the past 10000 years, the foundation place of Hinduism and Buddhism. A land of colossal history where one is over whelmed with culture, places, shrines, forts, languages, crowded markets and lively cities. In the midst of the vast subcontinent, which has such diverse landscape, and in the many rivers, which drain the nation, swims a classic game fish, still unheard of, by a lot us, the Mighty Mahseer of India. 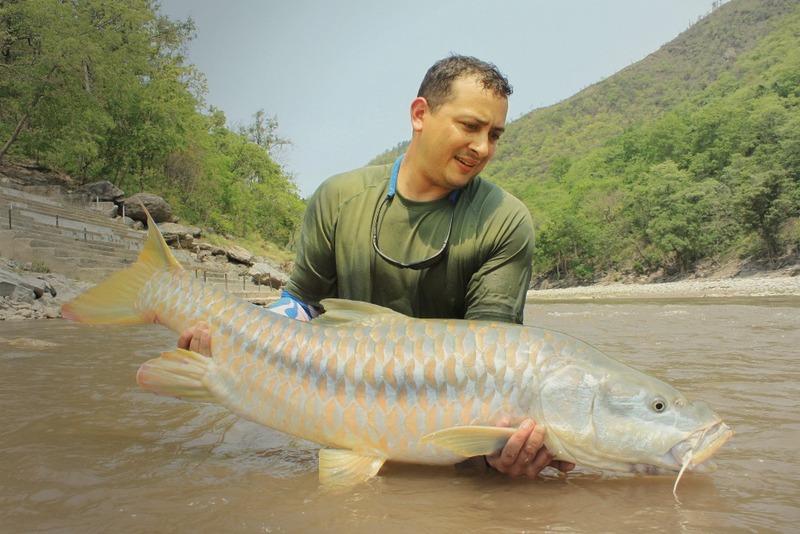 Undeniably, the Mahseer is one of the fiercest fighting freshwater game fish that exists. Pound for pound it had unparalleled strength and endurance. They do have a transitory likeness to the carp and the barbell of the English waters, but as they say, the similarity soon ends in the turbid waters of the Himalayan foothills. Often weighed against the lordly salmon, for their sporting competency, the Mahseer have overjoyed generations of anglers and time after time lived up to being called the “Mighty Mahseer”. The Legacy of this absorbing sport was brought into the country by the English during their reign in India and was passed on over the years to the Indians. The 18th century brought about a few accounts on the Mahseer by some ex-partite anglers who were captivated by the excellence of sport the Mahseer had to offer. Over the decades the word of its sporting abilities spread. The Mahseer of the south, which grew larger than their northern cousins we obviously given awareness and any avid angler who traveled to this part of the world would try his hand at the Mahseer of the South. The early 19th century saw a number of records being broken and the word on the Mahseer’s mightiness had spread far and wide. A number of anglers acquainted to the southern waters of the Kabbini and the Cauvery, made the most of the so-called golden era of Mahseer Fishing. The Van Ingen’s, famous Dutch taxidermists from Mysore, established many records, as they were perhaps the most frequent anglers on those waters. In 1922 the Van Ingens were guides to possibly the most eminent team of anglers ever seen on the Cauvery, the Prince of Wales (later Edward VIII). The Kabbini and the Cauvery were soon known for their heritage of monstrous fish lurking in their turbid flow. J. Detwet Van Ingen still holds the record of the largest rod caught Mahseer of a 120lbs caught on the 22-3-1946. After India achieved its independence, the angling scene suffered a setback, as the population shot up and India was soon one of the most populous nations of the world, pressures on all resources were high and the new government did not have an understanding for the sport, besides the government then had other priorities. 1947 to 1978 could be said to be the neglect period of angling in the Subcontinent. The Transworld fishing expeditions brought about the much-needed break through, in terms of the initial conservation efforts for the Mahseer of the Cauvery in the eighties. It was the re introduction of these forgotten monsters, to the angling world. 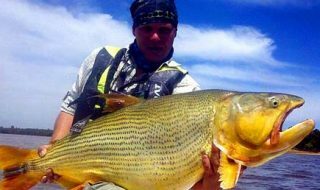 Robert Howitt, one of the team members soon convinced the government to protect a stretch of the river Cauvery by announcing a complete ban on killing the Mahseer. This lead to the quick revival of fish populations of the Cauvery, which were previously, suffering the effects of uncontrolled poaching in the region. The years ahead saw prestigious events like the Mahseer Maharaja world cup at the Cauvery and the consistent enforcement of controlled angling with minimal impact to the habitat of the fish. Over the year efforts of following up the example of the Cauvery are being made by various angling bodies all over the nation and results are showing. The Cauvery as its somewhere most enthusiasts visit in pursuit of the Mahseer, hence ignoring a very interesting fishery up in the north and north east of India, home to the commonest of them all, the Himalayan Mahseer, there’s an opinion a lot of anglers might have already formed on the Mahseer of India after fishing in the south, but till one has not had an encounter with the Mahseer up north, I think ones experience is incomplete. The Himalayas are indeed the perfect setting to take a Mahseer, and if one is keen on spinning or the fly, its just very well, need less to say that there are few fresh water fish in comparison to its sporting aptitude and which inhabit such torrential waters. Prior notes on fishing for the Mahseer in the north mention the capture of some giants too, A.St J Macdonald’s book, Circumventing the Mahseer, has mentions of fish over 55 lbs caught by him and others including a 75lbs fish in the early nineteenth century. Though he goes on to say that that there would be few anglers in the north who could count the fifty-pound plus fish they’ve caught in their life on more than five figures. 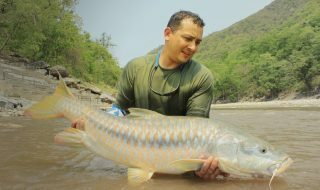 A fifty-pound fish in the north is considered a trophy, these Mahseer though are taken best on a lure or a fly, and something the Southern giants do not do. The Southern Giants are taken on a local form of Millet flower ( Ragi ), this paste is hardened and dressed on a 6/0 hook before its haled into the current. A lot of the former accounts on the Mahseer of India have focused mainly on the Mahseer of the north, the Himalayan Mahseer, due to the enormity of area they are to be found i.e. their distribution, the multiplicity in techniques they could be taken on and as they were to be found in all the rivers in North and in the river which drained the rain forest of the east. India has quite diversity of these fish, spread thought the subcontinent, to be found in all rivers, though perhaps the commonest of them all are the Himalayan Mahseer. This fish occurs all thought the north, north eastern and even parts of central India, the Himalayan Mahseer are one of the two most popular game fishes of India, the other ones are their larger more illusive cousins of the south called the humpbacked Mahseer. The fish are to be found in the Coleroon river system of Southern India, primarily the rivers Cauvery and the Kabbini. These fish are given an superior status due to the size they attain, above and beyond these two common types of Mahseer there are six to eight types acknowledged species of Mahseer, which are said to have comparable sporting features. The Mahseer inhabits the torrential, rivers and perennial rivulets of sub mountainous terrain, in the course of the Himalayas, they could be found up to and altitude of 2500 ft above sea level. The following rivers are considered to be the strong holds of the Himalayan Mahseer – the Ganges and its tributaries, the Eastern and western Ramganga, the Maha Kali and its tributaries, the Kosi, the Beas and its tributaries, the Sutlej and its tributaries, the Bhramaputra and its tributaries, Ravi and its tributaries, Yammuna and its tributaries and the Indus which flows into Pakistan. Due to the diversity of regions they are to be found in and the assortment of techniques they could be had on, fishing for them makes a particularly interesting pursuit. The Himalayan Mahseer too grow to enormous proportions, prior accounts pertain them to exceed lengths of seven feet. Now a day that would be a rare occurrence, though a 50 lbs fish is considered monstrous. The Mahseer have a prismatic range of shades on their large scales, in addition to their beautiful exterior, they have a firm appearance too. For the ones of us who have experiences her first rush, recognize what the Mahseer feels like at the end of the line. Perhaps the most significant sporting feature of the fish and the most intense adrenalin charge is felt when a fish takes the bait and begins the rush, it’s more sudden than you expect it to be, very impetuous, rash, impulsive, reckless or what ever you might call it. Some times it could be terrifying, as the bait is taken very rapidity. In the north of India, the best time to undertake the large snow fed rivers is from February through the middle of May, this as they are most liable to be clear and the water at a reasonably low level, by the month of April mid the river begin to rise progressively and the real snow melt comes in by the end of May. This timing slightly alters from year to year as and when the summer approaches. All chief river systems have a particular window period they produce the best fish in. Another good time to fish these snow fed rivers is, post monsoon, from the middle of September through till the middle of November. Confluences predominantly, during this time produce fine results, principally when the rivers are changing color and just about begin to maintain their usual color subsequent to the monsoons. Most fishing in the north if preferably done in the region of confluences, due to the kind of results they have produced over the years and for obvious reasons. Mostly, post monsoon when the reciting river gives the fish an indication to move down, the fish after laying their eggs are exhausted and hungry start their journey down to the lower reaches of the river, this is considered to be one of the best times to be fishing in most waters of north India. Predominantly, spinning is the most killing way to fish. As a generalization it would be rite to say that the best months to be fishing in the north would be March and October. The enormity of the Himalayan Mahseer’s territory leaves even currently some rivers and their confluences untouched by anglers. With that said, deep pools, which are in abundance, too make great spots for the fishing both on spinning and on baits. What usually makes it harder though is the flow, which the Mahseer for understandable reasons uses utterly to its benefit. The flow of some of these rapids one fishes in is so intense that one can hardly hear anything. The Mahseer of various regions of the country over time have adapted themselves to lakes as well. A fine example of this could be seen in the natural lakes of Kumaon, this region lies in the north Indian state of Uttaranchal, over the years it has adapted it self to the many man reservoirs in various parts of the country too. By and large Mahseer fishing is compared to fishing for the Salmon, for the similarity in methods more so in fishing for the northern Mahseer than for the southern fish. The kind tackle used for spinning or fly-fishing for that matter would generally be used for catching large Salmon. Truly the appeal of Mahseer fishing in the north is on either taking the Mahseer on the big river on spinning or the smaller clearer streams on the fly. The Mahseer prefer taking in clear water, in fact the clearer the better. The rougher the better too, he’d rather take in turbulent water. Thunder or rain may or may not hold back his unpredictable craving. His size is no indication of what he wants, the tiny fish of one pound or less will ambitiously take a four inch spoon, with the same readiness a monster of 30 to 40 lbs takes a half inch fly spoon. It is and remarkably omnivorous fish. The Mahseer is noted to be a discontinuous feeder. Green filamentous algae and other water plants taken in with intent or while seizing aquatic insects on them, Figs, other things thrown by humans, other insect, fish, etc has been recorded from the stomach of Mahseer. Mahseer migrate upstream, from the main river into the rivulets mainly during the southwest monsoon (July through September) for the purpose of spawning, this is when they ascend to substantial heights up to (2500 ft). Though migration process is not only due to the reproductive biology of the fish but also in search of fresh feeding grounds. The migration is a very significant feature of the Himalayan Mahseer’s life cycle and the fish moves extensively during this period. Over the years it has been subject to a fair amount of field research by ichthyologists, but still there are a lot of unanswered questions, which will only take years to reveal. India’s considered an outlying destination for most anglers, a majority of us of do not even bother exploring sporting possibilities when planning a trip here, one thinks of the prehistoric shrines, and the rich culture, least to state the adventure or the fishing bit of it, though, the Himalayas have long been considered the true land of adventure, for their celebrated snow capped mountains. Mostly, the lack of information on the fishing possibilities here makes it rather uninteresting for any one to look forward to a sporting experience. Out of the many rivers draining the Indian Himalayas there is sport to be obtained in almost all of them, some more than the others, however the timing and the right area are most vital. A majority of the Himalayan rivers in their due course down from the glaciers, drop rapidly in elevation, hence becoming quite turbid, which makes fly fishing in their upper reaches not very viable, and its only once the rivers reach a particular altitude are they fishable, with the fly. Here both glacial and spring fed rivers are productive in sport fish, the spring fed rivers by and large are more apt for fly-fishing as they run very clear for most of the year, the glacial rivers however are large and emerald green, they too, are clear for most of the year except in the peak summer months and in the rainy season. The temperatures of the spring fed and the glacial river vary tremendously. However, the glacial rivers produce fish on fly but are better for spinning, a technique, which is unquestionably rewarding. Spinning is the more killing and extensively practiced methods for taking fish in these rivers, and one of the reasons which attributes to that is the Mahseer’s fondness for turbid water, which in most instances discourages the fly from reaching the intended target. Though with the state of the art fly lines, manufactured in current times, makes it a little simpler, but still not quite as accurate. It is also the lack of availability of appropriate fly tackle and hence, the fly-fishing exposure in India, which perhaps has been a discouraging factor for most from perusing it. Some statistics might convince a lot of us of the sporting possibilities on fly in the region of the Himalayas, not only for the trout but also for the Himalayan Mahseer. On examining the stomach contents of the Himalayan Mahseer, it has been often observed that a major portion of its diet is aquatic insect. For a fish, which has proved from time to time to be a fierce minnow eater, which is clearly evident from its lure-taking propensity, it is quite encouraging to the fly angles. The old classic books of anglers who’ve travelled at length in the forests of the north and northeast speak mostly about spinning for the Himalayan Mahseer, thought, they do mention the Fly spoon often, something which worked tremendously for Mahseer. Thomas in “The Rod In India” goes on to vaguely describe the some patterns of flies, though most of them would not be taken without the correct fly line. Mentions of flies have been included in various accounts of the Mahseer, but without the rite fly line most of them would be worthless for the Mahseer, as the ground basis for it to work indeed, would be getting it to where it is meant to be, close to the river bed, as it might be already known to most of the readers that the Mahseer is more comfortable feeding at the bottom, or suspended deep. So what fly line? The basis of it has to be the sink rate, #3 – #4 – #5, in a weight forward of a shooting head taper, which ever one fancies. The faster the flow, the faster the sink rate should be. That’s with due regard to trying for the bigger ones. The big Mahseer will only take at the bottom. Unfortunately, it’s the smaller Mahseer; that show more enthusiasm to the fly. Though you might fish intermediate depths, its more likely you’ll be successful with the smaller ones. Insects are noted mostly form the bellies of the adolescents, perhaps as they feed more rapidly on flies than the mature fish. Still that is no reason for us to conclude that the mature fish will not take a fly as readily, then it is just question of the rite fly. What mostly makes it even more challenging is the flow, which the Mahseer for understandable reasons uses utterly to its benefit. The flow of some of these rapids is so intense that one can barely hear much. Besides the Mahseer, the Goonch a distinctive catfish is found in the vicinity of some of the spring fed rivers in the foothills of the Himalayas. Unfortunately, he doesn’t have a fondness for the fly, besides most of us would rather prefer the playfulness of a Mahseer to the sluggish head butting of a giant catfish. Some of these Gooch are gigantic and if not anything else, one enjoys watching them in the sparkling waters of these spring fed rivers. Some of the sport fish one can encounter in the Mahseer lakes, are large Grass carp, which attain weights of up to fifty pounds and put up a tremendous battle. The English introduced the Brown Trout somewhere around the turn of the century, first in the stream of Kashmir in Northern India. Kashmir is a land of some immensely beautiful valleys, it mustn’t have taken much for them pick the streams of Kashmir to introduce the trout as some of these rivers, just seem to be strait out of the fairy tales. The conditions made a perfect breeding ground for the fish and the fishery thrived in India from there on. Kashmir set an example to the rest of the nation, thanks to the introduction of this wonderful fishery in its water. Soon enough it attracted the attention of several enthusiasts from all around and shortly enough other states too followed the introduction of the Trout in their waters. Neighbouring, Himachal Pradesh sleeked the seed and soon enough had it going well for them selves too and so did some other regions in the visinity..
Perhaps one of Himachal Pradesh’s more successful fisheries has been the river Baspa, of Sangla Valley. The Brown trout taken here are consistently sizable. And the beauty of the valley tops it all. The region has one of the better-established fisheries, which stalks the river with seed. The trout is found in most of the tributaries of the rivers it has been introduced in, some of the more isolated beats are further into the valleys, produce the better fish for obvious reasons and due to the torrent and heavy cover are fished best on spinning. The River Ganges has provided tantalizing sport, which over the years, has been relished by sport fishermen from all over the world. 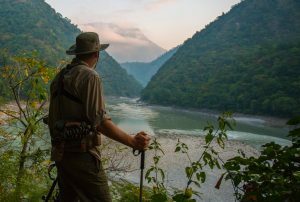 Mentions of this river could be found in most accounts available to date on the mighty Mahseer – its significance, from the Mahseer fishing point of view, elevates it high amongst the fishing rivers of India, with excellent fishing potential. The point where the rivulet Nayar meets the Ganges is one of the more famous fishing beats of the river. This place is called Byas Ghat, and is a great attraction for all anglers who want to take on the Mahseer of the Ganges. In 1989, international angling figures John Bailey and Paul Boot shot the hour-long documentary called “Casting for Gold” at Byas Ghat. A number of monstrous Mahseer have been taken from this beat in the years gone by. In the past the Ganges and its tributaries have been the ground, for a fair amount of field research by various ichthyologists too. Located on the border of India and Nepal, the river Mahakali is a torrential and voluminous river. Its location has ensured that it remains relatively isolated and perhaps this has been a major factor for it being one of the most productive rivers in North India for the Mahseer fish. The Kali is a snow fed river, just like most other Himalayan rivers, and originates from rivulets draining glaciers both in India and Nepal. It flows along the Indo-Nepal border and is joined by various tributaries along the way. Pancheshwar, is the Kali’s most famous beat, this is where the Saryu and the Kali converge. Over the years the finest fish have been taken from this beat. Its fame spread in the 60’s when some officers from the Indian Armed forces discovered it and found the fishing to be extraordinary. The Yammuna is another one of the more productive Mahseer rivers, it originates and flows mainly though the state of Utttaranchal, along the way it is joint by various tributaries, some of which hold great promise for the Mahseer. A lot of these spring fed tributaries are not very large, and run clear for most of the year – it’s a typical Mahseer river. Besides the Mahseer the river also sustains a population of Indian Trout. Mahseer fishing in India – a rush to the senses. The Govind Sagar Reservoir lies in the state of Himachal Pradesh, bordering Punjab, in North India. This is a gigantic reservoir that stretches along for some sixty square miles, into the heart of Himachal Pradesh. This starts from Bhakra, where the Bhakra Dam is situated, all the way to a place called Bilaspur, – the river Sutlej primarily feeds this reservoir. The Sutlej is a turbid and voluminous, glacial river, which runs murky during most of the year. The reservoir is an ideal place to fish it and is one of the prime habitat for the Mahseer, Grass carp, Silver Carp, Catla and various other Barbells and Catfish. Once the sun is out or when the fish are out in the deeper water, its best troll for the Mahseer – sometime the biggest fish of a trip can be taken while trolling. Fly-fishing is successful as well, but more so for the smaller fish. There’s an assortment of sport one could go for in this reservoir. The Ranjit Sagar Reservoir lies in the state of Himachal Pradesh, bordering Punjab – it stretches along for some fifty square miles, into the heart of Himachal Pradesh, creating a huge reservoir. The Ranjit Sagar Dam is more commonly know as Pong Reservoir. This reservoir is fed by the river Beas, one of the true holds of the Himalayan Mahseer. Some old records mention the capture of some gigantic fish from the surrounding areas. The Mahseer here are in abundance and the aquatic life is flourishing making this an ideal place to take on the hard fighting Mahseer. Since the fishing area is large, its a good idea to use a boat in this reservoir. Spinning is the most effective way to be fishing the reservoir; this is both from the shore and from the boat. Once the sun is out or when the fish are out in the deeper water trolling is very successful. This is perhaps one of the best place to fish for the trout in Himachal Pradesh and even neighboring Uttaranchal, Sangla Valley has only recently been opened for foreign travelers, it is close to the indo Tibetan border. The Baspa River is a tributary of the Mighty Sutlej. It joins the Sutlej at a place called the Karcham. The river Baspa forms some wonder pools at the point where it is fish; the fish populations are sustained by an old fishery established a few decades back. The river is host to some fantastic trout – I’ve caught and heard of other take some fine fish from here in the past few years. You can expect to catch fish from 1 to 5 lbs. Mostly Brown trout and even rainbow. The Pabbar has long been a favorite amongst anglers for guaranteed sport for Brown trout. A tributary of the Yammuna, it flows through the state of Himachal Pradesh and is fished best at a place called Dhamwari, with is on the upper reaches of the river. This stretch is pristine, very pictures with apple orchards and lush hills on either side of the river and is not fished very often. The Pabbar runs clear through most of the year. It is well stocked with brown trout and rainbow trout by a Trout farm situated close to the beat. A productive tributary of the river Beas is the Tirthan, a fine looking river with excellent prospects for trout, both Brown and Rainbow. The Tirthan is stocked by a well-established fishery, which has been around since some years. The river is renowned for sport both on fly and on spinning, some of the larger fish caught here are Brown trout. The larger fish stay in more undisturbed area and are to be found in the sub tributaries. There is some trekking involved in getting to the more isolated beats where some large Brown trout could be caught. The trout caught typically range from one to four pounds, though in the recent past the results have only gotten better, lately a Brown trout of eight was taken from this river. With efforts from the various angling bodies and with close vigilance on stretches of river which hold good fishing potential, the Mahseer will always live up being called a legendry game fish in the years ahead. PLEASE MENTION TOTAL-FISHING.COM WHEN CALLING!